Sheffield's Off the Shelf Festival of writing and reading in 2003. She has published seven books of her own ranging from novels, collection of short stories, essays and poems. A performance poet and a story-teller, Shamim works with Apples & Snakes for education. 'Performance Poet' is a relatively new term in UK, but Shamim said that it has been present in Bengali cultures from very early times. She performed in places including Museum of London, Cambridge Water Stone, Liberty Radio, Battersea Arts Centre, Lauderdel House, Commonwealth Institute, British Council of Bangladesh, Takshila in Pakistan and New York. Her poems were included in few Anthologies including British South Asian Poetry, My Birth Was Not In Vain, Velocity, Emlit Project and Mother Tongues etc and published in a special issue of Newyorker USA. She wrote bilingual plays- The Raft and co-wrote Hopscotch Ghost for the Half Moon Theatre. Azad's bilingual (English-Bangla) compilations and translations are Voyages and The Life of Mr. Aziz. She is also a trustee of well known charity One World Action, a school Governor and Chairperson of Bishwo Shahitto Kendro London. Azad received the Bichitra Award in 1994 from Bangladesh, Year of the Artist 2000 Award from London Arts, Sonjojon- A Rouf Award 2004 & Civic Awad in 2004 in UK. A three week long Creative Writing Workshop was conducted at BRAC University on the last three Saturdays (21st and 28th July and 4th August) by the renowned poet Shamim Azad. Organized by the English Department of BRAC University, the two main organizers of this event were Nausheen Eusuf and Sohana Mansoor, Lecturers of the Department. Here, attendees of the workshop, comprising of both teachers and students got to practice on their creative writing skills and learnt techniques in which they could improvise on their future writings. 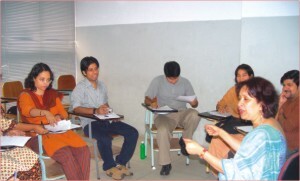 The workshop constituted of various fun activities which finally worked as creative writing exercises at the same time. One of the best part was a small game where participants had to start talking on a given topic and after a while random objects (unknown to the speaker beforehand) were passed on to the speaker who had to somehow incorporate that into his or her topic of discussion. It could be as irrelevant as a 'hairbrush' in a discussion of 'Global Terrorism', or a 'candle' on 'Immigration'! The art lied in incorporating the object skillfully into the discussion without stopping for a single second. All the participants came up with some really 'brilliant' ideas during this game, much to the delight and applause of all others present. Shamim Azad is devoting her entire summer this year to different activities in Bangladesh with organizations like The British Council, Muktijudhho Jadughar and BRAC University. She's also conducting story telling sessions for the specially needed children in M H Pre School in Banani. On the 9th August, Thursday Shamim Azad has launched her book 'Om', which is a collection of Bengali poetries. This event was attended by renowned literary figures like Dr Syed Manzoorul Islam, Professor of English in Dhaka University, Poets Rafik Azad Tarik Sujat and Aditi Falgun. The poet is very excited about her new book since it is her first Bengali publication after a sixteen year gap. She hopes her readers will enjoy reading all the poems in the new book 'Om'.